Relax by the water at Bellevue Beach and Beach Mansikkalahti. Museum-lovers will get to explore Seurasaari Island and Open-Air Museum and Natural History Museum (Luonnontieteellinen Museo). 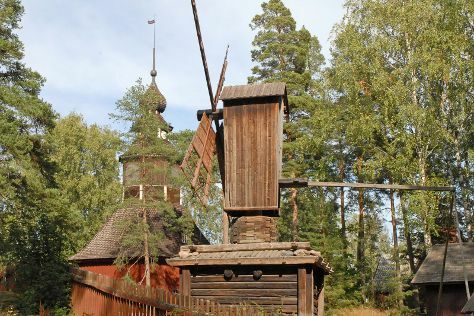 You'll find plenty of places to visit near Helsinki: Castle Hill (in Porvoo), Hanko Water Tower (in Hanko) and Kotka (Langinkoski Imperial Fishing Lodge Museum, Kotka Church, & more). There's lots more to do: explore the world behind art at Kansallisgalleria, test your problem-solving skills at popular escape rooms, take a stroll through Ullanlinna, and examine the collection at Helsinki University Museum (Helsingin Yliopiston Museo). If you are flying in from France, the closest major airport is Helsinki Vantaa Airport. In May, daily temperatures in Helsinki can reach 18°C, while at night they dip to 7°C. Finish your sightseeing early on the 15th (Wed) to allow enough time to travel back home.